Inane decisions have come at us like a water cannon this year, so none of us ought really to be surprised by any announcement. But the news that art history is to be dropped from the A-level syllabus after 2018 had me clutching for an armrest. Is it Halloween already? Are the National Socialists back? AQA, the only exam board to offer art history as an A-level, has taken the grim decision to axe this marvellous subject for bleak reasons. The first of them, the one that had me choking on my carpaccio, is that it says it cannot find “sufficient experienced examiners” to mark the papers for the new syllabus. Ha! There are enough experienced art historians living within a couple of miles of me in north London to mark the nation’s art history papers 10 times over! I probably have enough on speed dial. If AQA cannot find enough in the whole of Britain, it needs to go on a Duke of Edinburgh weekend to learn some basic search skills. No. Let’s deal here with the second and real reason for the axeing, which is that in the ghastly post-Govian mindset of our education overlords art history is viewed as a distraction. It doesn’t lead directly to a job. It won’t put a roof over your head. Only toffs are interested in studying it. In the especially irritating nomenclature currently employed for these things, it’s a “soft” subject. Grrr. What’s really happening is that a collapse in educational values is taking place on our watch. And during this collapse in values, the understanding of our history through art — the best and truest understanding there is — is being viewed as a luxury. This new mindset has taken an axe not just to art history, but to humanity’s mirror. Here is an example. What does Henry VIII look like? 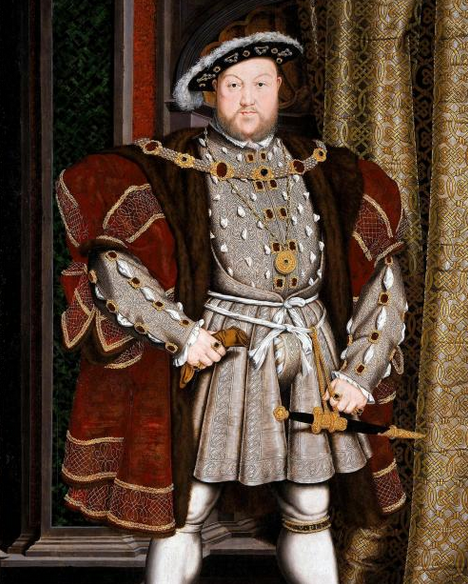 Go on — everybody loves a Tudor, so what does Henry VIII look like? Well, he’s fat and jowly and looks a bit like Arthur Mullard. How do we know this? Because his court painter, Holbein, a German genius brought over from Basel, has left us an unforgettable image of him. If Holbein had not painted Henry VIII as fabulously as he did, none of us would ever have been able to visualise Bad King Hal as tangibly as we do. A crucial slab of British history would have remained faceless. Let’s go back even further. What is the earliest display there is of human civilisation? What proof survives from our ancient past of the cultural sentience of Homo sapiens? It isn’t a book. It isn’t a play. It isn’t an accounting ledger or a syllabus. And it most certainly isn’t a display of politics. Long, long before we humans got round to doing any of that, we were descending deep into the bowels of the earth, as far as the cave system would take us, and drawing things on the walls. Animals, mostly. But also our own evocative handprints, which would touch our ancestors across the ages. When we wanted babies, we carved fertility statuettes. When we needed success in the hunt, we imagined it on the walls of our caves. When we wanted water, we drew it. When we needed to know what we were worshipping, we asked art to describe the gods. “Soft” subject? Art history is the most revealing window we can open onto the human condition. And let’s kick this “privileged” thing into touch as well. I was not a toff. My father was a cleaner on the railways in Basingstoke. My mother was a milkmaid. Neither of them had got past the third year of school. The war saw to that. No one in my family had ever gone to university before. But I did. Because of art history. It saved my life, if you must know. Art history lifted me out of a dark immigrant’s existence, where people washed their dogs in our communal bath, and turned me into a graduate. I was eight months old when my father was run over by a train in Basingstoke. I never knew him. I couldn’t speak any English till I was six. But I could look at paintings, at sculpture, at books full of pictures of beautiful things, at all the glorious art-historical evidence that survives from the story of humanity, and I could enjoy it and learn from it. It soothed me. It educated me. Not just about my own world, but about all the other worlds out there. It filled my head with hopes and dreams. If it weren’t for art history . . . well, I dread to think how that sentence should end. One day I even found out that Picasso’s astoundingly intimate image of two enraptured blobs going at it like the clappers on a sandy beach was painted on my birthday — January 12. Who needs family photos when you have art history? Of course, I am making this too personal. But that’s art for you. It communicates stuff deep inside you to stuff deep inside other people. It’s a vital tool of human interaction, and always has been. Before there was language as we know it, before there was history as we know it, before there was anything as useless as party politics or Govian education reforms, there was art. Understanding its story is a crucial human qualification. So go out there, AQA, and find some examiners. Trust me: they exist. You call yourself an educational board? Well, start educating.